Thanksgiving dinner is right around the corner and with it comes a lot of Thanksgiving leftovers. Here is a delicious recipe for lasagna. 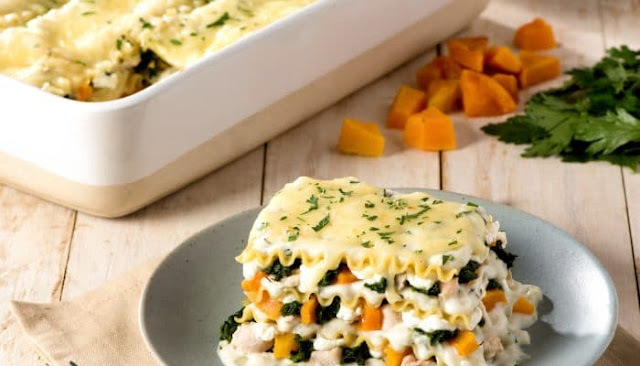 In addition to your leftovers, there is also spinach, light cream sauce, and low-fat ricotta. Heat oil and butter in the skillet set over medium heat; cook onion, garlic, sage and thyme for about 5 minutes or until softened. Sprinkle flour over top; cook, stirring, for 1 minute. Gradually whisk in milk until smooth. Bring to boil, stirring constantly. Reduce heat to medium-low; simmer for about 10 minutes or until slightly thickened. Stir in salt, pepper, and nutmeg.